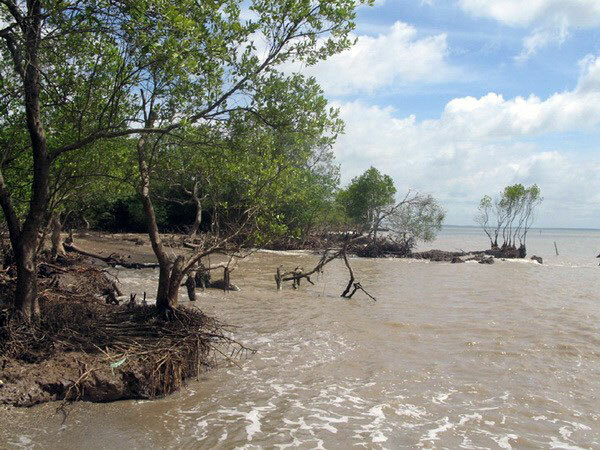 Erosion is threatening residential areas and shrimp farming land in coastal areas of Go Cong and Tan Phu Dong districts in the southern Tien Giang Province. A protection forest in Go Cong Dong District has been encroached by the sea. Over the past decade, the sea has eaten away over 1,100 hectares of land in the coastal areas in Go Cong, according to the provincial division for irrigation and flood and storm control under the provincial Department of Agriculture and Rural Development. Similar situation has been seen in many islands located where Cua Tieu and Cua Dai rivers flow into the sea in Tan Phu Dong district. According to Chairman of the district People’s Committee Nguyen Quoc Khanh, in 2016, sea encroachment claimed 211 hectares of coastal land, causing damaged to the houses of 26 families along with shrimp farms and other facilities. Another 152,000 sq. m. of land along local rivers were also lost due to erosion, putting the life of 142 local households on the line. Strong winds and high tides have increased sea encroachment, particularly during the stormy season from September to December, said Huynh Phuoc Hai, Deputy Director of the division of irrigation and flood and storm control. The province has taken numerous drastic measures to address the situation, including planting protection forests along coastal areas in Go Cong and Tan Phu Dong districts. Management and protection of local forests have been strengthened while the Go Cong sea dyke is being upgraded./.